90% of US farmed crayfish are produced in Louisiana where this species is native. Crayfish farmed in the US and especially the Louisiana area is considered to have sustainable aquaculture. Crayfish have life history characteristics such as brooding their young which allow aquaculture populations to be self-sustaining by reducing the need for nursery production or collection of wild stock. Wild stocks of Crayfish in the US are generally considered stable but some are under pressure and are listed as endangered, threatened or vulnerable. Crayfish farming in the US is not currently regarded as a threat to these wild populations. Crayfish are usually farmed in agricultural ponds or in rotation with a crop such as rice. Crayfish farming does not require supplemental feed. Instead, crayfish feed on leaf matter and small animals that live in the ponds where they are cultured. In the US, farms must be licensed and must adhere to Environmental Protection Agency (EPA) regulations regarding the use of chemicals and the release of effluent. 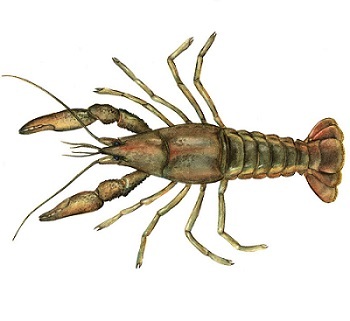 Parasite and disease transfer to wild stocks is often a concern for aquaculture operations; however, there have been no reports of this being an issue for US farmed Crayfish. Crayfish are cultured at relatively low densities and chemicals are not typically used. Crayfish often escape from aquaculture operations and can have a negative impact on the surrounding habitat by competing with other species in areas where Crayfish are not native. However as they are native to Louisiana this is not a significant concern. Most imported Crayfish come from China where this species is not native. The majority of Crayfish produced in the US are from Lousisiana where they are native and farmed in a more sustainable manner. Crayfish are usually farmed in agricultural ponds or in rotation with a crop such as rice. Crayfish are cultured at relatively low densities and chemicals are not typically used. Crayfish frequently escape from farms and establish themselves in the surrounding habitat as an invasive species, disrupting food webs and reducing the number of native plant and fish species. Parasite and disease transfer to wild stocks is often concern for aquaculture operations; however, in China there are no native crayfish stocks, so this is not as much of an issue. Crayfish brood their young, a life history characteristic that allows aquaculture populations to be self-sustaining by reducing the need for nursery production or collection of wild stock. Crayfish farming does not require supplemental feed; instead the crayfish feed on leaf matter and small animals that live in the ponds where they are cultured. Aquaculture in China has expanded very rapidly and it is not known whether the appropriate controls are in place to regulate the production of Crayfish to make it a sustainable industry. Production of crayfish in Louisiana has been historically variable, but catches have remained below 20 million lbs since 1999. The majority of crayfish produced in Louisiana is from aquaculture operations, and about 11% is from the wild fishery. Crayfish have life history characteristics that make them resilient against fishing pressure such as a short lifespan and quick time to maturity. Abundance and fishing mortality are unknown because of a lack of stock assessments and variable environmental conditions which influence the population number. The crawfish fishery is minimally managed. The only regulations consist of a commercial fishing license and minimum mesh size. No limits exist to control the areas fished, the number of crawfish caught, their minimum legal size, or number of traps used. Scientific research and monitoring of the population is sparse. The use of traps allows any bycatch to either escape through the mesh, or to be released live by fishermen. No species of concern are caught by the crawfish traps.Traps cause little habitat damage as they are immobile structures that are retrieved by hand by the fishermen, causing less damage than marine traps that are retrieved mechanically.